The defender, a native of the city, denied having celebrated a victory against Lega with Castilla with a comb against his countrymen in 2011. On Monday he was whistled in Butarque. 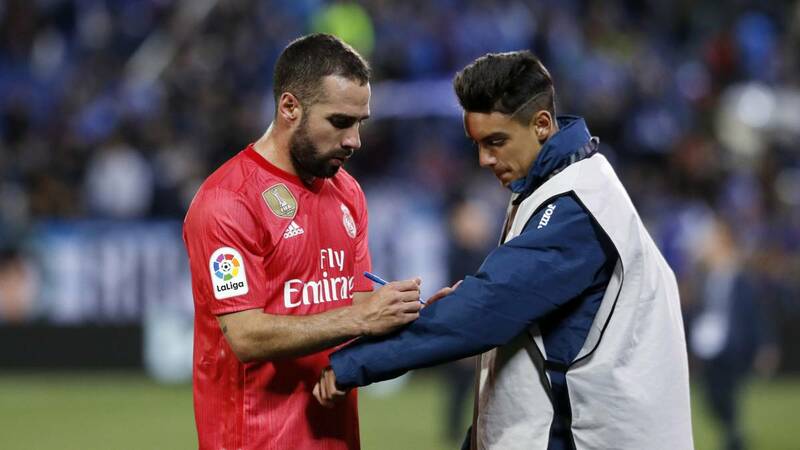 Leganes fans have shown throughout their discomfort with Dani Carvajal, Real Madrid defender and native of Madrid, , after that, in a mixed zone, after playing in Butarque, he affirmed that it was a "lie" that in 2011 he made a comb to fans pepineros displaced to Valdebebas to attend a match between Castilla and Lega. For that affront yesterday, every time he touched the ball, he was whistled by a remarkable part of the respectable blanquiazul. "The Butarque whistles? I stay with the people who applaud me when I come here. Some accuse me of making a comb to Leganés in a match with Castilla and that's a lie, "said Carvajal, , the city's favorite son and, therefore, sports and social reference of all Leganés. The duel of the controversy, of Segunda B, was played in March 2011 and ended with a white win by 2-1. According to the nearly 500 visiting fans, Carvajal celebrated it by facing them. His attack of euphoria crowned him, they relate, taking the finger out of the controversy. "I was there and saw how Carvajal celebrated the victory too effusively. It caught my attention because I knew then that he was from Leganés. Then he made us that beautiful gesture, "says Javier Herrera, current director of the Federation of Peñas del Leganés.
" Personally I have always defended Carvajal. I always thought that was a girlie. An immature gesture of a boy of 18 years. But yesterday I was disappointed when he called us liars to those who saw what happened. He had the opportunity to be like a gentleman, admit what happened and ask for forgiveness. A shame, "continues Herrera, who also remembers that last season there was another controversy with the white defense.
" He pushed a ballboy with bad manners. Those kinds of attitudes are always ugly, but more so if it's in front of people in your city. He is the favorite son of the city. I should be more careful, "ditched Herrera. Like him, dozens of Leganés fans, especially those who were present in that duel, reproached the football player his statements through social networks and recalled that, already in the first team, Carvajal celebrated a goal against Barça at the Camp Nou with the same gesture.